You can only get it in 2 flavors: standard 350 L in front and awd, and 450h L (no pricing available yet). Let’s start with the fwd pricing. There are a total of 11 exterior color options. None of them are extra cost. I choose Black of course. What’s weird is that there are F Sport options that aren’t for the L model. Selecting, say the one F Sport exterior color choice changes the model from the L to a standard RX350 which doesn’t make sense to me. Why have the options if they aren’t available? So Basically, no matter what you see, you cant get an F Sport trim on the L.
This confusion extends into the interior color choices. At first, there looks to be a total of 13 interior leather/trim options. But in actuality there are only 4. The other 9 are available with select option packages or are for the F Sport trim. To avoid the confusion, to go with the Black exterior, I choose Noble Brown leather interior with Matte Linear Dark Mocha wood trim. Navigation/Mark Levinson Premium audio package $3,200: Includes the Mark Levinson surround sound system with 15 speakers, something called Lexus Enform Destination assist with the nav system and 12.3 inch display, Lexus Enform App Suite, the stupid touch pad, and automatic climate control with smog sensor. Navigation Package $2,120: Is pretty much the Mark Levinson Package without the sound system. Cold Weather package $315: Includes a windshield wiper de icer, fast heating interior heater, headlamp washers, rain sensing wipers and auto leveling headlights. Towing prep package $265: Includes a heavy duty radiator and engine and trans oil coolers. Premium Package $810: Requires a specific interior color and trim choices. You can only get this with Espresso Walnut, Matte Bamboo or Matte Linear Dark Mocha Wood trims and comes with a power tilt and slide moonroof. I added the Navigation/Mark Levinson, Premium and Luxury packages. Adding the Luxury package required I change my interior color choice to the trim listed in the package. I dont get why Lexus does that. Heated leather wheel (no wood) $150. Meaning if you choose the aforementioned wood and leather wheel for $450, you’ll be be paying $300 bucks extra. For wood. Second row captains chairs are an option but are dealer installed so they dont have a price. I added the headlights, touch free door, the hud, and the BLIS with pano view. I added none of the accessories. 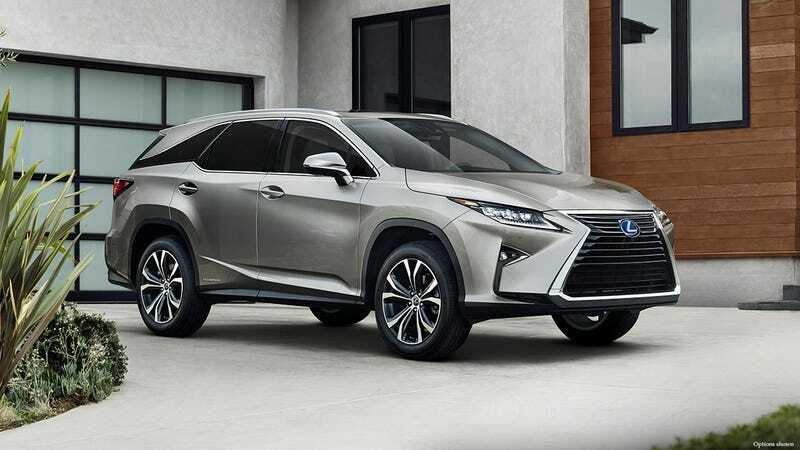 All in, a 2018 RX350 L is an eye watering $61,870. With awd and the same options? $1400 more at $63,270. At this price it becomes hard to justify because you are in the price range of nicely equipped full size SUV’s from literally everyone else. You would have to be one of those customers Lexus claims had been asking dealers for an RX to drop 60k + on an RX with a 3rd row with questionable room and even more questionable cargo capacity because of said 3rd row. For $415 less you can have a Suburban LT with the Luxury package. Hell Toyota’s own Sequoia, a no optioned 4WD Limited model is $1850 cheaper. Granted it’ll be less fuel efficient but still. The RX L looks to not be a good buy at all if you make it how a Lexus should be.